Speaker of the Lok Sabha is the presiding officer of Lok Sabha. He is elected by the members of the Lok Sabha from amongst themselves somewhere after the newly formed Lok Sabha first meeting. The Lok Sabha Speaker under normal circumstances remains the Speaker as far as he is the member of the Lok Sabha. He loses his seat as a speaker when he is not a member of the Lok Sabha. He can also resign by addressing his resignation to the Deputy Speaker of the Lok Sabha. If he has to be removed by the House, then a resolution has to be passed by the majority of all the members of the Lok Sabha after giving a 14 days advance notice to the Speaker. When a resolution for removing the Speaker of the Lok Sabha is taken up, then during this time period the Speaker cannot preside over as the head of the house. During this time the Speaker acts as a normal member of the House. He can take part in the proceedings of Lok Sabha and vote on bills in the first instance. When the Lok Sabha Speaker acts officially he doesn't votes in the first stance and has a casting vote in case of a deadlock. The office of Lok Sabha becomes important looking at the fact that when the Lok Sabha gets dissolved the Speaker still remains unless the new Lok Sabha is formed. The Speaker is the head of the Lok Sabha, and its representative. He is the guardian of powers and privileges of the members, the House as a whole and its committees. He is thus much more than merely the presiding officer of the Lok Sabha. In these capacities, he is vested with vast, varied and vital responsibilities and enjoys great honour, high dignity and supreme authority within the House. Has been provided security of tenure. The resolution for removal has to be passed by absolute majority and removal motion should have support of at least 50 members. Remuneration i.e. Salary and allowances belong to non-plan expenditure. They are charged on the Consolidated Fund of India. The power of the Speaker to regulate and control the proceedings/business of Lok Sabha is not subject to the jurisdiction of any court. In Britain, the speaker has to resign from the political party after being elected to the office, however no such condition exists in India. # Maintains order and decorum in the House so that business and proceedings of the House can be carried on properly. # Adjournment of the House is done by the Speaker. # The meeting of the House is suspended by the Speaker in the absence of quorum. # Has the power of Casting Vote in the event of a deadlock. # Joint Session of both Lok Sabha and Rajya Sabha summoned by the President of India is presided over by the Speaker of the Lok Sabha. # Speaker decides on the disqualification of members in accordance with the Anti-Defection law provided under 10th Schedule of the Constitution. # Speaker decides whether a Bill is a money bill or not. # He is by default the Chairman of Business Advisory Committee, Rules Committee and General Purpose Committee. # Speaker appoints the Chairman of all Parliamentary Committees. I will detail only the most important points in relation to the Deputy Speaker and not in detail. # The office of the Speaker and Deputy Speaker originated as the President and Deputy President under the under the provisions of Montague Chelmsford reforms(Government of India Act 1919). # They remained President and Deputy President till 1947. # The Speaker and Deputy Speaker do not have to subscribe to any special oath for the office. They have to only to subscribe to oath and affirmation as being done by other Member of the Parliament. # The process of removal of a Deputy Speaker is similar to that of the Speaker of the Lok Sabha. # He will address his resignation to the Speaker of the Lok Sabha. # The Deputy Speaker performs the functions of the Speaker when the Speaker is not present in the sitting of the House. # When Speaker is present, Deputy Speaker acts as any other normal member of the House. # When Deputy Speaker is a member of any of the Parliamentary Committee, he automatically becomes its Chairman. # His salaries and allowances are charged on the Consolidated Fund of India. 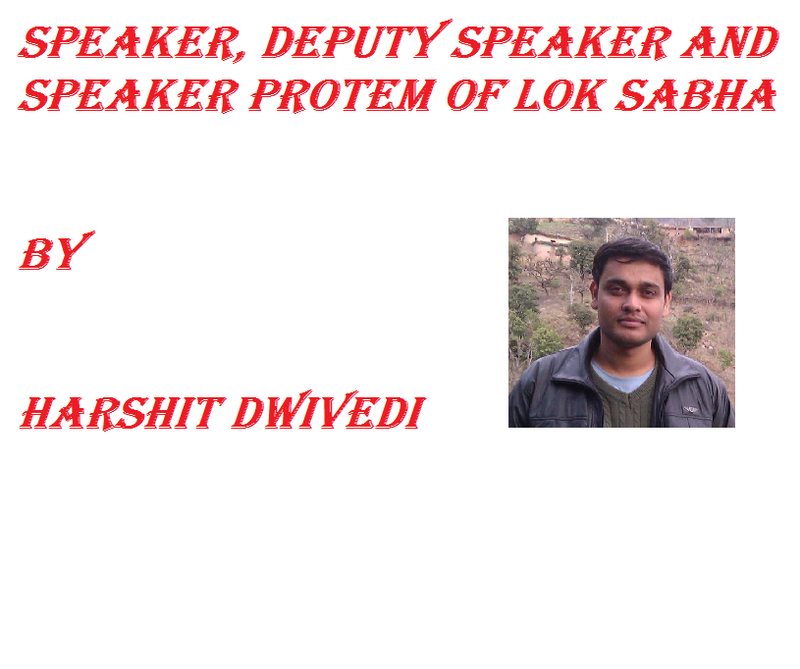 # Deputy Speaker is not subordinate to the Speaker. He is directly responsible to the Lok Sabha. Under the provisions of the Constitution, just before the first meeting of the newly elected Lok Sabha, the Speaker of the previous Lok Sabha vacates his office. President usually appoints the senior most member of the Lok Sabha as the Speaker Pro-tem. President himself administers the oath to the Speaker Pro-tem. The responsibility of the Speaker Pro-tem is to administer the oath to all the members of the newly elected Lok Sabha and also assist in the election of the new Speaker of the Lok Sabha. After the new Speaker has been elected, Speaker Pro-tem ceases to exist as it is a temporary arrangement.